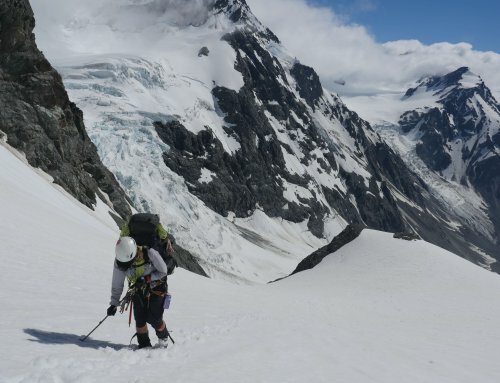 A rough night at Longview Hut can mean only one thing…a detour. The hut shook all night. From outside a fierce wind battered the little building while on the inside Matt battered our ears with his snoring. Earplugs didn’t help, but we were all cosy as the hut creaked, groaned and shuddered around us. If you were to judge hunters by the bloody gruesome portraits of them and their unimpressed prey that feature in the hunting magazines which live in the corners of most backcountry huts, you’d think they were all psychopaths. We haven’t met a bad one yet. Although the two we shared the hut with looked like Special Forces in their camo, balaclavas and boots they were in fact refreshingly normal and funny guys. Matt, the snorer, suffered vertigo and spent the night worrying how he was going to make it down to the carpark. We’d watched their slow climb to the hut the night before…we thought they’d been sightseeing but Matt had been stressed by the steep cliffs. They’d come up for a quick hunt and had hoped to go out early in the morning for a kill but the wind was so strong they opted for the easy-out option. We watched as they cautiously made their way up the windy knob before their climb down. We’d coincided our traverse of the Ruahine and Kaweka Ranges with the roar. It’s a time of year that the mountains are bathed in a sweltering miasma of testosterone. Male deer reek of their excitement apparently and boast of their fertility by…roaring. Male humans get pretty excited by it all too. They wander the same mountains roaring back hoping to excite their randy targets enough to expose themselves long enough for a clear shot. Our two bunk mates were slightly early for the season, but we’d heard a pretty aggressive sounding buck a few metres from us as we entered the Pohangina Valley. The hormones were certainly starting to rise. This can all make the bush a pretty dangerous place which is why Fiona is wearing her safety orange top in most of the photos you see…I, possibly stupidly, refuse to cheapen my wardrobe with such tasteless garb. We’ll be passing close to the site of a fatal shooting the previous season. A young hunter, his friends and a dog were having a rest on the track that hunters and trampers use, when one of them got shot through the neck by another hunter out on a solo mission. Shrapnel hit one other member of the party and the dog. We could tell by the roar of the wind that our trip across the tops to Howlett’s Hut was out of the question and as we walked up from Longview into the raging gale we were proved right. Standing was a problem. Walking was almost impossible. We ducked from tussock to dip to rock pile as we made our way past our planned turnoff to Otumore and on to the low route via the Tukituki River and Daphne Hut. It was exhausting work. We both got blown off our feet several times and had to regularly stop to catch our breath. The constant roar of the wind made conversation and requests for help almost impossible. Sign language and pointing got us to where we needed to go. When we got to the Daphne Junction a sign told us it would take us 45 minutes to return to Longview Hut. We’d taken 135 minutes to get there. Our heads spun from a lack of oxygen, our legs and arms ached from trying to hold us upright. And I was starting to feel…very ill.
Reports of a serious Rotovirus outbreak in Nelson Lakes earlier in the year flashed before my overactive imagination as I walked down the sheltered and well maintained track to Daphne. As my stomach growled I started to get the sweats. Were my aching legs and neck a forewarning of explosive diarrhea and projectile vomiting? The urge to fart was difficult to suppress as I jolted my body down the steep hill. The forest, mottled light and bird song would’ve been nice if I was in the mood. Fiona was having a grand old time. We hit the river and made our way to Daphne. The Tukituki is a much friendlier beast than the Pohangina, but it still wound through the hills for almost a kilometre…or was it ten,? I couldn’t tell. ‘I’ve only got two rolls of bog paper!’ I worried. I walked right past the hut and was only woken from my trance by Fiona yelling…something annoying like, ‘I’ve found it you idiot and it has a toilet!’ Grumpily I turned back. ‘Know it all’,I muttered through clenched teeth and sphincter. My pack was dumped and I made my way nonchalantly to the long drop. It sat in a bushy glade like some sort of shrine. Appropriately it was painted rescue orange. As I did what one does is such situations I wondered what I’d done that Fiona hadn’t. We ate the same food and drink the same drink. We shook the same hunters’ hands…wait a sec. ..that was it. The stoat. I’d pulled it from the trap the day before and hadn’t washed my hands. I walked back to the hut where I ate lunch, had a drink and gobbled a couple of digestive-tract-stalling Panadeines. Let’s just say the rest of the afternoon went without a hitch. We both made it to the top of Daphne Spur in one piece and I still had my two rolls of toilet paper. At Howlett’s Hut we dried our wet boots by the coal fire, ate a meal and checked the Norwegian Weather Gods. We’d been worrying about the next day’s journey for months and wind would make the precarious trip a no go. The next day we would take on our Nemesis…Sawtooth.